According to a university press release, the new 14,000 square foot facility is located in the Bioscience Park Center and will serve academic, clinical and commercial investigators, both Colorado-based and nationwide, looking to translate their discoveries into clinical-grade products suitable for investigational use in humans. Patrick Gaines, executive director of the Gates Center for Regenerative Medicine said, "We want to develop patient treatments faster," Gaines said. "This facility now allows us to take ideas and fully develop them through to patient delivery." "We can work for researchers who are at the university, but we can also work for the spinoff companies that they generate," said Timothy Gardner, Gates Center director of finance and operations. "If we were on this side of the street (the nonprofit educational campus), we would not be able to work with the spinoffs. That's a big thing." Dennis Roop, PhD, director of the new Gates Center for Regenerative Medicine said, "That proximity (to UC Medical) is huge," Roop said. "It's a facility where scientists and clinicians can just walk across the street, manufacture their product, and walk it back to the hospitals." Research at the GBF is off to a great start, as well. In 2014 alone, Gates researchers received nearly $120 million in research grant funding from the National Institutes of Health and several other private and public funding entities. In addition, the center has secured financing for the new $17-million biomanufacturing facility through 2018. "Everyone who comes here is just blown away by the state-of-the-art campus," Roop said. "And now having this facility, being so convenient and in walking distance, it's just a dream come true." According to Aurora Biz, the new Gates Biomanufacturing Facility that opened last year joins only five others like it in the nation. In addition, it will be the only such site within a 500-mile radius. The University of Colorado Anschutz Medical Campus is a major contributor to medical and life science research, as reflected in its scores of grant winning scientists, researchers and educators. The Anschutz Medical Campus in Aurora is a $380 million research marketplace and a leading consumer of biotechnology and laboratory products. Anschutz is the newest and most modern facility in the world regarding the combining of patient care, research, and education. It is the only one of it's kind with complete state-of-the-art facilities and groundbreaking research and innovation occurring every day. CU Anschutz Medical Campus gained more than $772.4 million in private support. The University of Colorado, Anschutz Medical Campus is ranked 33rd in the nation for Life Science R & D Expenditures. Consists of more than 8,000 employees, including more than 5,000 faculty teaching graduate and undergraduate programs in 13 schools and colleges. Laboratory vendors interested in reaching out to researchers in the well-funded University of Colorado life science market will be attending the 7th Annual BioResearch Product Faire™ Event at The CU Anschutz Medical Campus on July 22, 2016. Last year, the BioResearch Product Faire™ Event at the CU Anschutz Medical Campus attracted 450 attendees from 12 different research buildings and 49 on-campus departments. 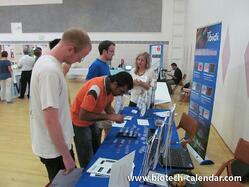 This is the most well-organized, popular biotechnology event of its kind in the Colorado area. Don’t miss this opportunity to market your products directly to Colorado researchers at this 5-star biotechnology and lab supply event.